When we arrived at our dock, we saw a large volume of smoke rising above the burning boat as the firefighters pumped water into the boat. We caught our breaths as we returned to Anacortes Marina yesterday afternoon and saw a column of dark smoke rising above the Anacortes waterfront. As we got closer, we realized the smoke was coming from our marina or somewhere very close to it! When we arrived at the parking lot, we found many emergency vehicles filling the area, most with lights flashing. We saw that the smoke was coming from A Dock, which was a bit of a relief, because our boat is on B Dock. The Skagit County Sheriff’s boat pumped lots of water into the burning boat. Foam was being pumped on from the dock. Firemen on the dock and on the Skagit County Sheriff’s boat were pumping water into a burning 54-foot powerboat that was moored just outside the covered slips. 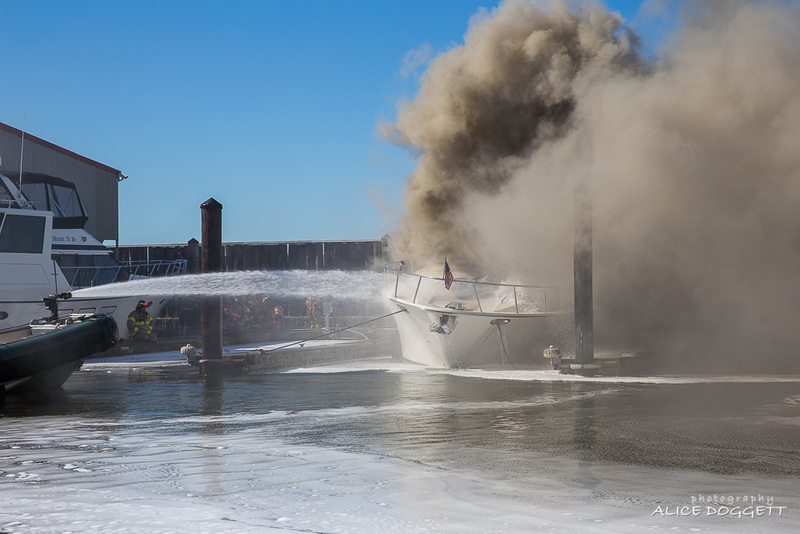 The boat was still engulfed in flames and spewing out a large volume of smoke. The wind was carrying the smoke toward our boat, so even though the fire wasn’t threatening our boat, we were concerned about the smoke. Not only did it look ugly, it smelled horrible! Water was pumped from the Skagit County Sheriff’s boat and also from the dock. We had left our windows open while we were gone because our boat heats up quickly in the afternoon sun. So we rushed to get the windows closed and make sure our kitties were okay. There was a bit of smoke and a strong smell of burning fiberglass inside, but it didn’t seem dangerous…and the kitties were fine. We closed the windows and kept them closed until later in the evening when the smoke eventually cleared. I grabbed my camera and we headed back down the dock to find out more about what was happening. 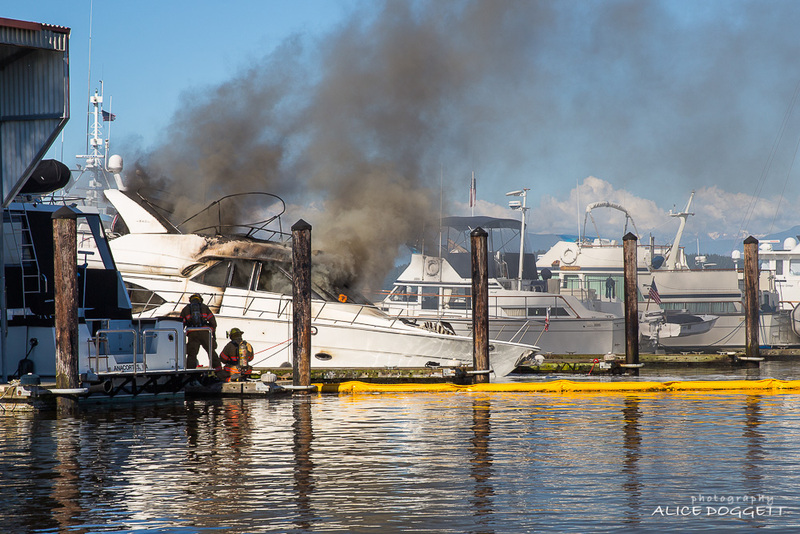 We heard that the boat had just returned from a cruise and no one was aboard when the fire broke out around 3 PM. We got there shortly after 4 PM. 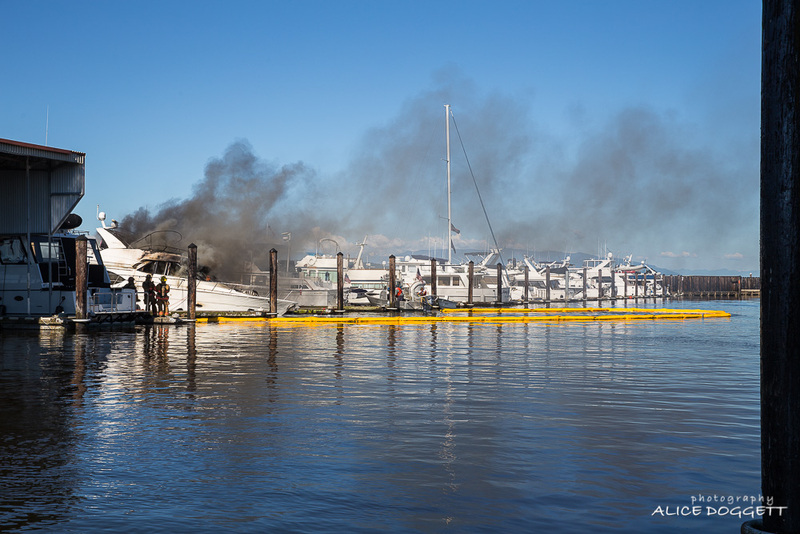 The marina staff and others had moved nearby boats so the fire was threatening only the one boat. The firemen continued to spray water and chemicals on the boat, both from the dock and from the Skagit County Sheriff’s boat. Soon we saw the Global Diving & Salvage crew boat come in with a floating oil containment boom. They used the boom to surround the area around the boat and contain any leaking fluids and residue from the burned boat. The salvage crew boat towed in a floating oil containment boom. Flames continued to flare up inside the burning boat. 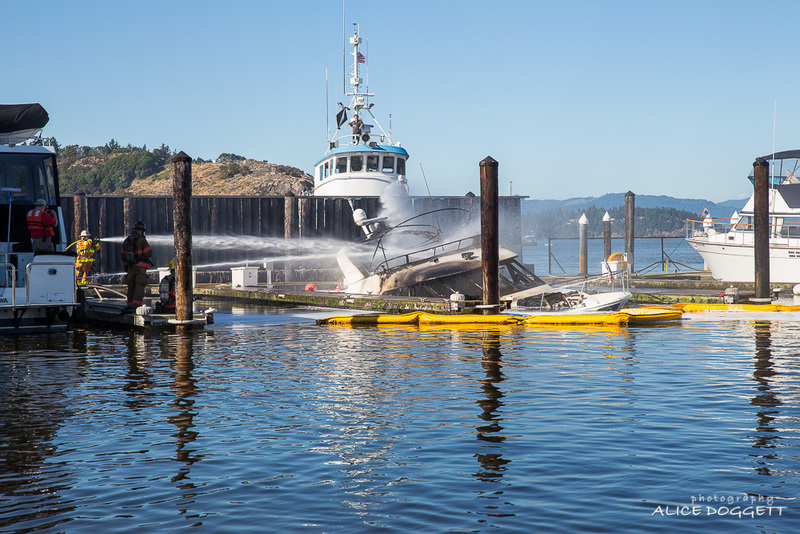 The floating oil containment boom was deployed in a circle to contain leaking oil and fuel. We watched the boat slowly sink and realized that the only way they could put out the fire was to sink the boat. It took quite a while for the boat to fill with water, and it finally sank and the fire was out around 6 PM. 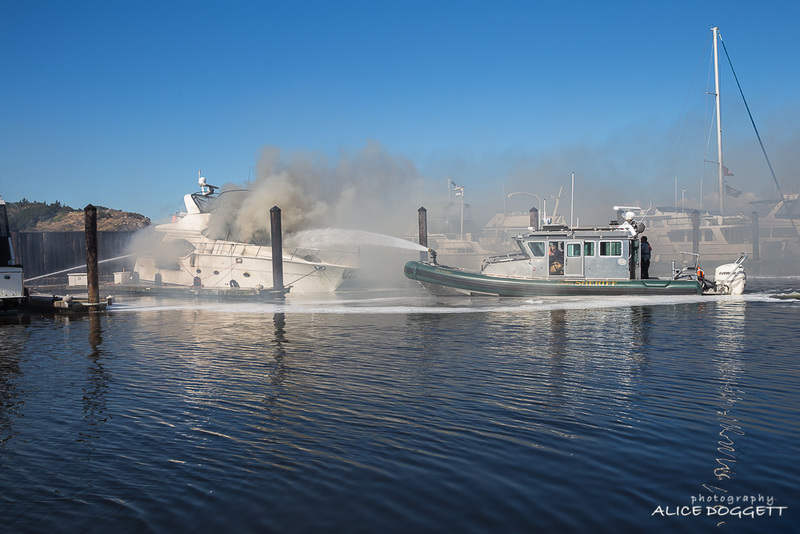 The burning boat started to sink as water was sprayed from many directions—the dock, the sheriff’s boat, and even another tug that came up behind the seawall. The burning boat continues to sink. A firefighter continues to hose down flames in the burning boat after it hit the bottom and the smoke finally stopped. At the end of the event, the burned boat sits on the bottom. This morning, the burned boat was sitting on the bottom, with an oil-containing boom around it and the surrounding slips. All that was above the water line was the fly bridge and pilothouse. A dinghy mounted to the boat deck behind the pilothouse was also above water. Divers and cleanup crews arrived early this morning to begin the process of mopping up leaked oil and fuel, and prepare the boat to be lifted out of the water and hauled away. This morning we walked over to see the boat. 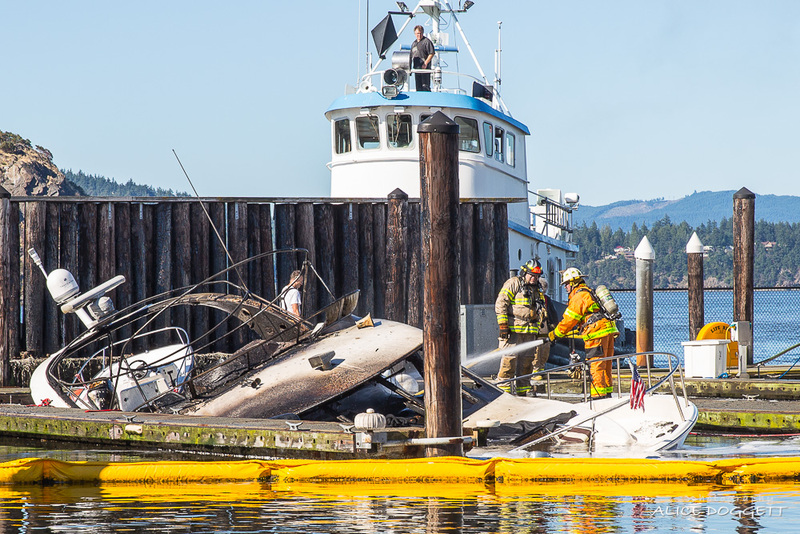 The salvage crew was spreading sheets of absorbent material to mop up spilled fuel. A barge with crane arrived mid-morning. It was a rather tight fit getting into the marina! 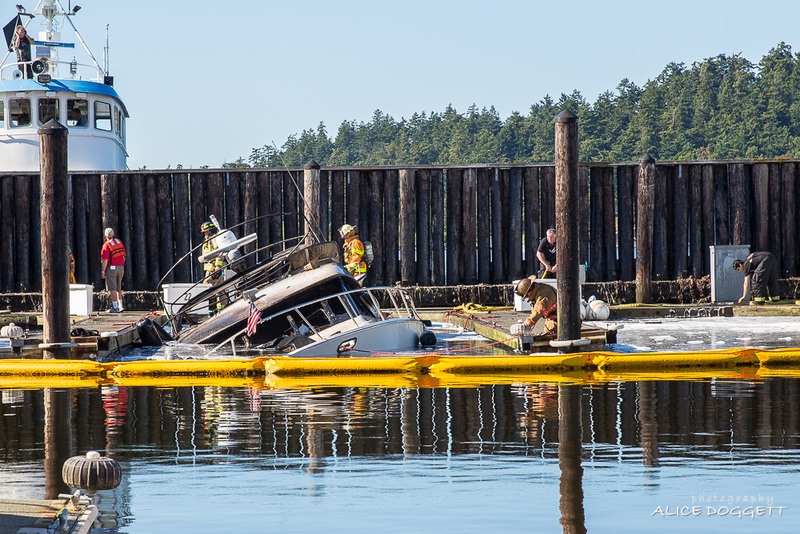 They positioned the barge in front of the burned boat in the fairway between A and B Docks, and a diver went under the boat to secure straps to lift it. They also began pumping out water so that the weight of the boat would be reduced. We were asked to leave the area when the crane got the boat loaded into the straps and slightly lifted above the water. The tension on the wires holding the boat would be extreme and they were concerned about one of the wires breaking. We didn’t hesitate to leave! 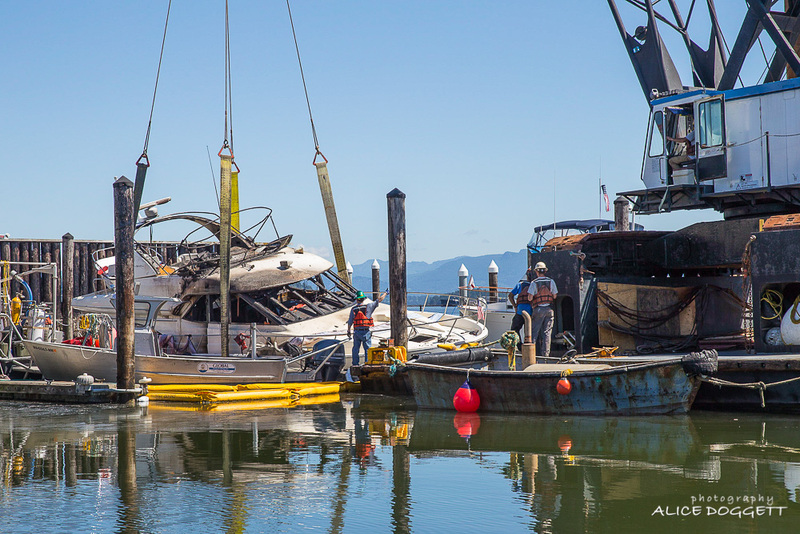 This morning the boat was lifted off the bottom by a crane that came into the marina on a barge. After the boat was floating again, we were told that the hull was intact so the boat can be towed to a nearby facility for the fire inspectors to look it over. They are now pumping out the remaining fuel in the tanks, and then the plan is to tow the boat away. 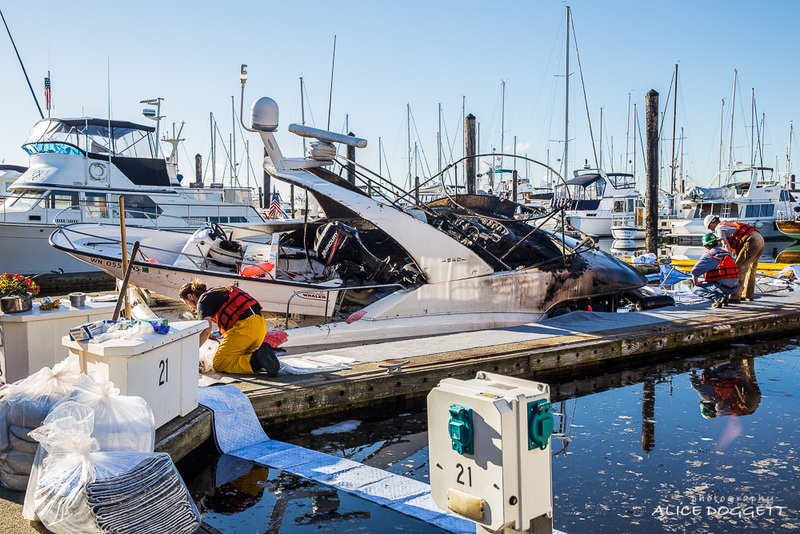 The boat that burned is a Meridian 540, a 54-foot powerboat. We understand that it is a charter boat and earlier in the day had been cleaned up by the charter company’s cleaning crew to be ready for a new charter due to arrive later in the day. Their charter plans literally went up in smoke! We also heard that the people returning the charter boat had put about 700 gallons of fuel on just before returning to the dock. Of course, that means there is a greater concern from an environmental perspective, as that is an enormous amount of fuel with the potential to leak. 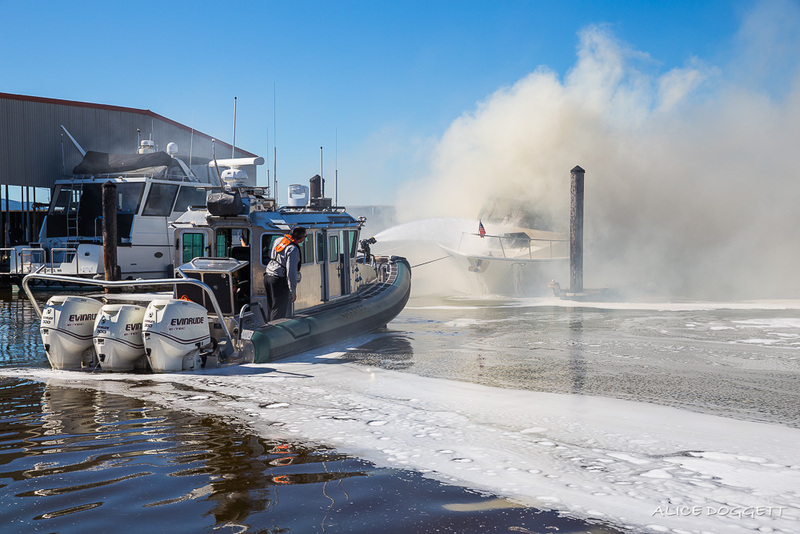 The firemen, environmental rescue crews, and our marina staff did an outstanding job of getting the fire contained and securing the rest of the marina. Our heartfelt thanks to all of them! 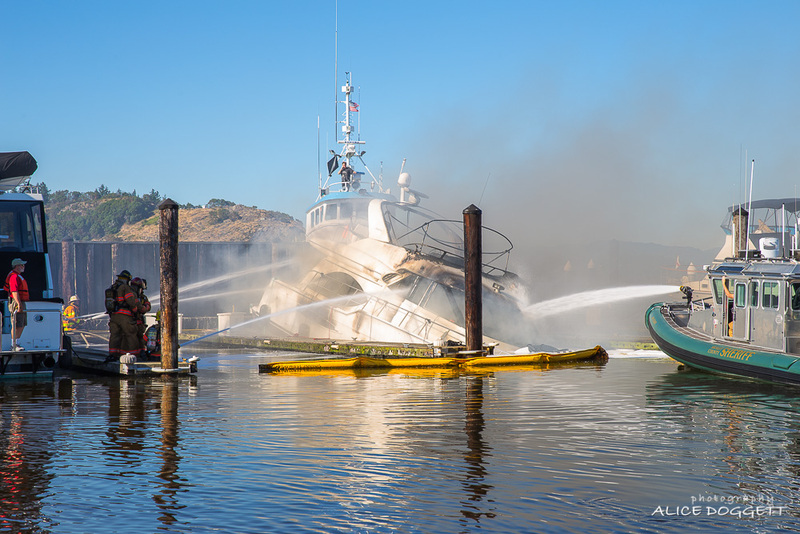 This entry was posted in Cruising, Life Aboard, Travel and tagged Anacortes Marina, boat fire, environmental rescue, Global Diving & Salvage, marina fire, Meridian 540, oil containing boom, Skagit County Sheriff boat by Sailor Lady. Bookmark the permalink. This was the Gamapotay. Our family was scheduled to charter it next week. Glad to hear no one was injured, and the company has made other arrangements for us. Thanks for telling us the boat name. We tried to find it on the boat, but when we looked for the name, the boat was underwater! Aren’t you glad this didn’t happen while you were chartering the boat! Nice to know that the charter company found you another boat. Enjoy your cruise! 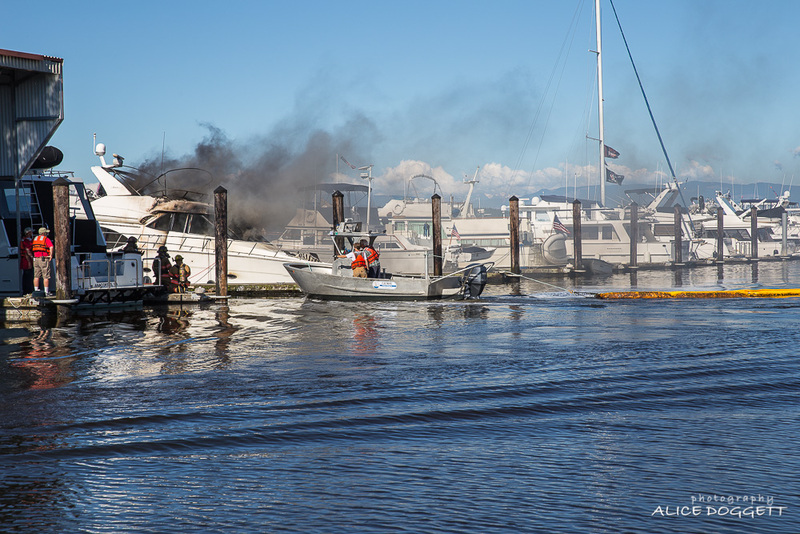 Thanks for providing the pictures and detailed report of the fire at Anacortes Marina. Thanks for your feedback! Glad you found the story interesting…bet you were glad to not have to worry about your boat being here! Good to hear from you. Hi to Helen! HI Alice, Thanks for your excellent photos. I have passed them along to friends who own a Meridian. Thanks, Suzy. It’s been a rather hectic event here. So glad no one was hurt or any other boats were damaged.